Ringing The Closing Bell at NASDAQ Today!! Take the train! ($250) — Pros: Cuts my total travel by 2-3 hours!, and I can still work and read/etc while sitting down more comfortably. Also – LESS chance of traffic, and the trains seem to leave every 30-60 minutes till late night (and if I take a late night one home, I get $50 off). Cons: HELLA EXPENSIVE!! And that rate up there is WITH the discounts :( If I were to take the super fast Acela train instead, it would cost an additional $125-$150 round trip – though it would cut the total time to about 5 and 1/2 hours than the 9 in option #1 up there… also, the metro trip to the train station and back is still in play too, bleh. Wanna guess which one I ended up going with? Before reading on? ;) Well, at first I was TOTALLY going with option #1 – the driving part. But after getting through the other options and REALLY thinking about it, I realized that it would probably be the most UNSAFE, as well as most ANNOYING, plan on the table. So I scrapped that one fast. Plus, it’s really not *that* cheap anyways – it’s right smack in the middle as far as all the other costs. How about you? Which option would you have chose? Or would you have not even gone to begin with? Haha… I know it’s not *as* exciting as some of us feel it would be, so in that case just pretend you’re going to visit a hot girl/guy instead. Which route would you choose then? PS: Another pro of taking the train? You can drink beer! Haha… both before-hand, and while ;) Not that it skews my judgement, of course. I would have totally taken the train. I used to travel for work by train to NYC quite often out of Harrisburg or Lancaster, PA (no alcohol on that train). Of course it wasn’t my dime back then, but even now I would opt for the train over the bus. It is a far better ride, you can sleep, get work done, or just veg out. My first and only train ride was when I joined the military, and I barely remember it, so I definitely would have taken the train. In fact, I’ve considered the idea (in that mythical “when we have more money” time) to take a train ride around the country. Megabus!!!! If you book early enough you can get to NY and back for under 20 bucks. I use them all the time to get NYC from Baltimore. And they have wifi. So does bolt bus. This frugal gal would have made the same decision! Time is money, too, and you free up some of yours by taking the train. Being able to work during the trip would be important to me as well, and the train seems to be a better option for that. Have fun – I’m so excited for you! I would have told the family to do without me for a couple days, booked a cheap hotel and taken my sweetie along for a fun weekend getaway to NYC! Forget worrying about the journey, enjoy the destination baby! Of course I should point out that I can commit such a thoughtless and frivolous act because sweetie and I were mildly frugal and saved our pennies back in the day…. Oh yeah, and I could not be more jealous of you. JMo, thank your dad for his service and sacrifices today…and thank you for being such a huge military supporter! and yeah, being able to drink and travel? game on! I would probably take the train. Your time is worth money too, so by saving time and taking the train, you are saving some money, especially if you can get yourself to work while on the train. When it comes to traveling, I am all about traveling less frequently and making it as convenient as possible when I do travel. I hope the train ride in was pleasant and productive. Have an awesome day! I’d totally take the train… so much more efficient than the bus, plus I find it easier to get work done on the train rather than a bus. Have an awesome day, it sounds like you are going to be spending it very well. 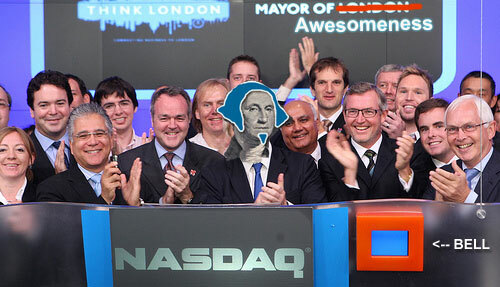 Plus, who wouldn’t love to be at the closing bell for NASDAQ?? I would have split the difference: train to NYC since it was important to be relaxed and on time, and then the cheap-o chinatown bus or megabus back home for 20 bucks. This was tense; I was thinking ‘I hope he din’t take the bus and that he is not daft enough to drive there’. Glad you went on the train – I would have done the same. In fact I do it often; though trains here are very expensive and in fact it is cheaper to fly. Trains are great for dong all the stuff I don’t like doing – much work done and always some time left for rest and fun. I normally catch the bus when I head to NYC. But I’m glad you picked the train. It sounds like a MUCH better ride and I’m pretty sure the time savings makes it worth it. Because that 2-3 hours saved is priceless! I will seriously consider the train the next time I have to head up there. That’s so cool. Mohawk sure helps pick you out of the crowd. Too cool, J $exy!! So glad you got to do it! It was so cool guys!!! DEF worth the trip (even though I was barely alive when I made it back home to DC that night — I was on the train more than I was IN New york! haha…) And guess who surprised sang for us in the middle of lunch? Country singer Josh Gracin from American Idol! Haha… was pretty dope. @@JustHeather – Thanks! I was able to get a lot of email work done, but not too much on the laptop as the stupid wifi didn’t work properly on it? It did on the iPhone but not the computer :( Oh well, I did a ton of reading though! @lora kathleen – It was a site to be seen, that’s for sure :) I hope you get a chance to participate in it one day, I think you’d love it! @CrystalH – Yeah, if I weren’t in a rush and I was staying longer, I probably would have just drove. Or maybe taken the bus, but now that I took the train I may be spoiled and have to go that route again – it was SO EASY! I’d have flown. Fare for one from National is $128 round trip.